Around this time of year, concrete canoe competitions are being held on several college campuses around the country. 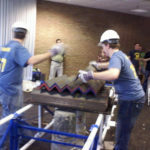 These events were typically the highlight of of my ASCE involvement. My favorite story about concrete canoe came the year after I graduated. I had planned to enjoy the competition as a bystander, but the circumstances would present one more challenge. “It broke!” The concrete canoe had not survived the road trip from Ann Arbor to Akron. “Well, how badly is it damaged,” I dared to the team captain. He wasn’t sure. The truck carrying the canoe had departed separately, and the team members transporting the canoe had just called ahead with the dire news, giving few details. We walked down to the parking lot and waited for the U-haul to arrive. The mood was dour as the team re-united. They refused to disclose the extend of the damage until the back doors of the truck were thrown open. Climbing in, I saw two independent pieces. It had snapped in half! If there were three weeks until the competition, it may have been possible to recast the canoe. Instead, the team expected to race in two days. They were out of the competition, and all their extra hours of work on the project were for naught. Time that could have been spent studying or partying had been devoted exclusively to the ungrateful canoe. Who to blame for such futile efforts? The captain’s mix design decision? The driver of the truck? The department of transportation and their woeful Midwestern roads? “No way!” It could not possibly be repaired within the rules they argued. I agreed, but stood firm in the commitment that the team would in fact complete the races. I urged everyone to relax, grab something to drink and be prepared for the oral presentation the following day. The captain was still in shock. “What do you have in mind?” he cautiously asked. I didn’t have an answer or a solution. All I knew was that we would find some way to make the canoe float. From that point on, I would constantly be shadowed by shaken but hopeful captain. Another friend was coming from Ann Arbor later that night. I dialed him right away. “Hello, Kevin. Um, grab a pen a paper. Can you do something for me?” He knew that I was about to implicate him in some crazy undertaking. I would count on him to bring some construction materials, then I’d need his ideas to make the canoe float again. 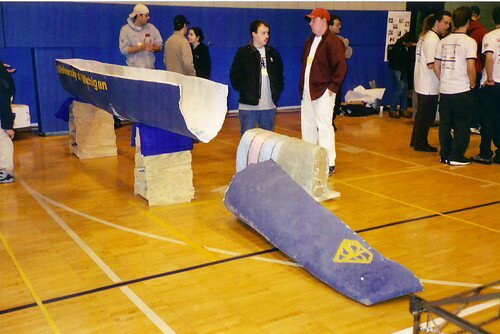 The next day, the team transported the broken canoe to the presentation hall. Unable to even feign a complete product, half the canoe was simply placed on the floor below the canoe stand. All were able to examine the causes of the catastrophe. As in some previous years, the team attempted to use an engineered cementitous composite design. 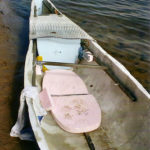 A carefully balanced concrete paste with a high percentage of well-distributed fibers would theoretically be able to hold the canoe together. However, At the location of the crack, it was obvious that the fibers were not sufficiently long or distributed. Even if we bridged over this crack, would the rest of the canoe walls hold? There was only one way to tell. The presentations went well. The team was well rehearsed and had prepared a very good powerpoint presentation. For many of the team members, this was their second or third year on the team. They had hoped this would be their time to shine. Their resilience was being put to the test, but they might still have their chance to shine through adversity.